Tate’s School celebrated Founder’s Day on Monday, September 24th, the start of their 50th school year serving families in the greater Knoxville community. Founded in 1968, Lou L Tate started Tate’s School in the educational wing of Erin Presbyterian Church in Bearden. A working mother and teacher for many years, Tate sought a school that would focus on what she believed was important; a strong academic curriculum, personalized instruction, hands-on learning, a strong emphasis on moral character, and an appreciation of God’s world. When she didn’t find a school that met her requirements, she started her own. “When I began the school, I had no idea that it would come to fruition as it has. I have been so very blessed to work with so many talented teachers and thousands of students and families over the years. I feel honored to be able to celebrate 50 years of doing what I love, “said Lou L Tate, CEO & Founder. In the early 70’s the Tate family was able to purchase acreage on Cedar Bluff Rd that became the new location for the school and has grown into the 54-acre campus you see today. With over 200 students, the school provides instruction for three-year-olds through the 8th Grade. Lou L Tate is known for her sense of humor and making learning fun. Her arrival today was no different. 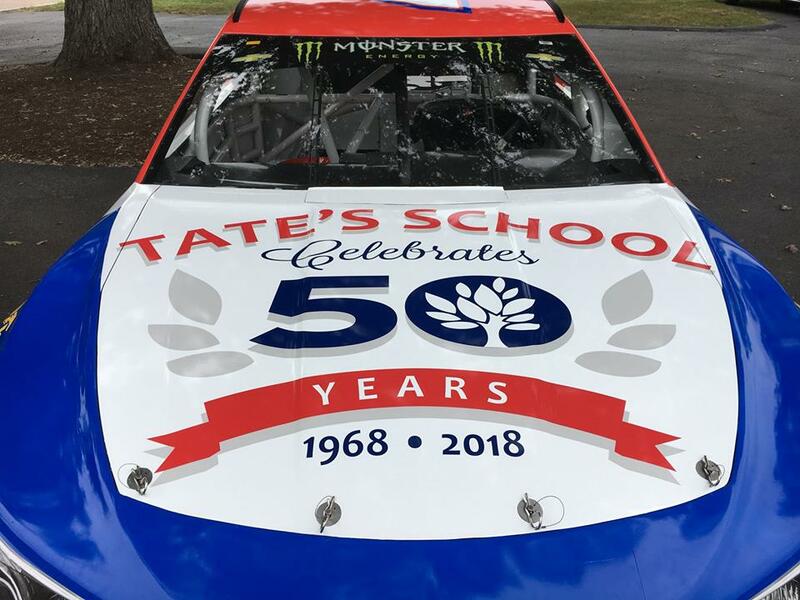 The roar of her vehicle could be heard loudly upon her approach and the students were shocked to see Mrs. Tate driving a NASCAR race car decked out with the 50th Anniversary Logo on the hood. Her race car, customized with the Tate’s School logo, was provided by daughter and school alumni, Jodi Geschickter, owner of JTG/Daugherty Racing and the only female team owner in NASCAR. “We are so proud of our Mom and her legacy of learning. We are certainly excited about the recent growth of the school,” said Jodi Geschickter. Tate entertained the crowd with stories of what the campus used to be like 50 years ago including cows breaking out onto cedar bluff road, how buildings were added to campus, and the unique contribution her mother, Helen Staples, made to the development of the school while serving as bookkeeper and music teacher. Joe Tate, husband of Lou L Tate , rel estate developer and former principal of Cedar Bluff and Ball Camp schools, joined in the program by playing America the Beautiful on the coronet. Students joined in the with singing of the alma mater and a strings ensemble performance. Miniature donkeys and horses (provided by S.T.A.R.) were on hand to honor the memory of Prince, a beautiful, black horse, and Maudy, a donkey rescued from a test lab, who spent approximately 20 years together on campus. Students enjoyed interacting with the animals, eating commemorative “50” cookies prepared by the Chef, and forming a human “50” while one of the middle school drone instructors documented the event from above. Community service and character education has long been an integral part of Tate’s School. To celebrate the caring culture of Tate’s for the past 50 years, Principal Kaye Simmons, shared that Tate’s School has developed a program called “50 Acts of Service” which focuses on helping students and families in our community. “We are honored to have partnered with the Department of Children’s Services for the past 4 years. The “50 Acts of Service” program will expand our support and impact even more foster students in need. We will also assist nearby social workers as they seek to remove barriers to education for at-risk students from preschool – 8th grade,” said Simmons. Anniversary celebrations will continue throughout the year including the Halloween Homecoming Celebration for Alumni on October 26th, 50 Flavors in the Dining Hall, Spirit Week, and will culminate in a fundraiser in March to fund scholarships for bright, deserving students. In the past three years, Tate’s School has opened a middle school and four new buildings. Recent expansion is part of a five (5) year growth management strategy which has included a new 8,500 square foot Athletic & Dining Hall, chef prepared meals on campus, and the graduation of the first class of 8th graders last year. To view the full album of photos from the event, click here. To view news footage of the event, please click here.